The Premier League – Best in the world? The Premier League (or as pundits, managers and players insist on calling it, The Barclays Premier League) is often referred to as the “best league in the world”. Other terms you are likely to hear in relation to the English top flight are references to the league being the ‘promised land’ and ‘where everyone wants to be’. Due to the vast sums of money involved, this is certainly true for the football clubs themselves. The Championship play-off final is said to be worth £90m to the winners, often leading it to be labelled as the richest game in football. With the amount of money in the game increasing every year, it won’t be long until the victors go up the Wembley steps to be presented with a giant cheque by Chris Tarrant, before an open top bus parade with the players waving £50 notes at their adoring public. While football club chairmen devote themselves to the Premier League in a fashion more sickly than a teenage girl’s Facebook status about her new boyfriend, things appear to be changing amongst the fans. Manchester City have sent back 900 tickets for their away game at Arsenal, priced at a truly ridiculous £62 each, taking the cost of the day out to well over £100 when travel expenses are considered. I went to the Emirates for an FA Cup tie, and made the foolish mistake of ordering a pint. I was then asked for £4.80, despite me explaining I only wanted one and I was perfectly happy with the standard plastic glass instead of a solid gold goblet, it didn’t make a difference. Reaction on social media to Manchester City fans taking a stand against modern ticket prices has been predictably mixed. While many supporters of other clubs have shown support, an equal amount have used it as an opportunity to make jibes at the City fanbase. It has become a popular trend to criticise Manchester City fans, despite the fact the overwhelming majority of them were there before the oil money when they were stupendously rubbish, and they’ll certainly be there when the Sheikh decides to move on or buy Disneyworld instead. Just as the problem is not down to Manchester City, nor should it be fully laid at Arsenal’s door. You don’t have to tell the Arsenal fans their ticket prices are too high, they know. As I write this it has been seven years and seven months since Arsenal last won a trophy, while any star players they managed to accumulate over this time now making a living in Manchester or Barcelona. The sale of Robin Van Persie to Manchester United in the summer shows just how much the mentality at Arsenal has changed in recent years. There was a time where the Patrick Vieira vs. Roy Keane inspired battles between the clubs were so bitterly fought that Jeremy Kyle should probably have stepped in, the idea of a star player moving between the two was unthinkable. When Arsenal moved to the Emirates from Highbury, they stopped caring about being invincible and started to worry about income instead. Many fans across the Premier League have stopped talking about how useless their left back is or why their striker is superior to anyone their rivals have. Instead, bank balances, tax forms and profits are used as point scoring. I’m all for terrace banter, but “You’re less financially solvent than us, and you know you are!” will hopefully never catch on. While Arsenal have rightly been criticised for their £62 tickets, I was convinced this would not be the only match of the weekend which would price many fans out of the game. I decided to find out the cost of a ticket for every other Premier League matched scheduled for the same weekend. 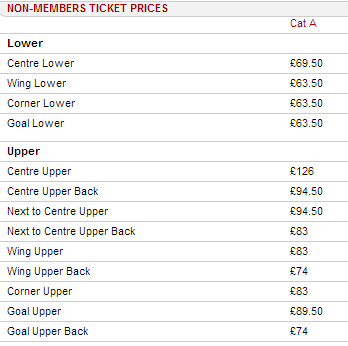 Listed below are the ticket prices for a standard seat in the vicinity of the halfway line for each Premier League club for the weekend of the 12th – 13th January 2013. Of course, the £62 tickets for Manchester City fans have been in the spotlight already, but out of interest I decided to see how much the fans in the home areas of the ground had been expected to pay. Thankfully I don’t know what it feels like to suffer a massive heart attack, but discovering the price list for someone to watch an Arsenal game certainly came close to changing that. ONE HUNDRED AND TWENTY SIX POUNDS. I was sure this had to be some kind of mistake, and they had accidentally listed the prices for the hospitality areas. Not quite. The cost of an executive box for ten people to watch Arsenal vs. Manchester City – £10,000. Of course, these boxes are not meant for the average fan, but it does raise questions as to why they are expected to fork out the best part of £100 for a league game, when Arsenal are clearly making obscene amounts of money from corporate fans. These extortionate prices seem to be reflected throughout the league, with the average price of a Premier League ticket this weekend working out at roughly £43. Sunderland have the cheapest tickets available of any club on offer, although not everything is rosy for fans of the North East club. 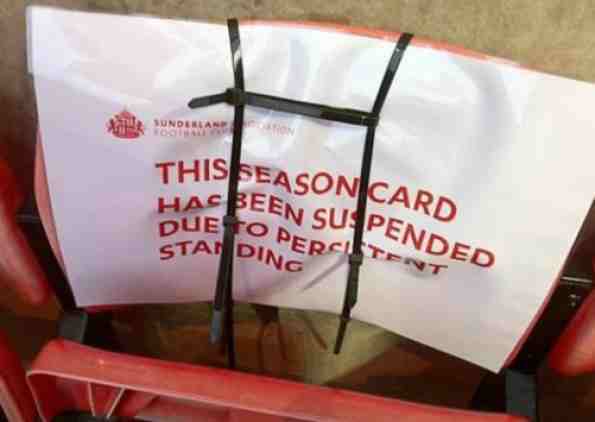 It was revealed recently that several Mackem season ticket holders had had their access to the stadium revoked for standing. A much shared picture across social media showed one particular fan who had their card cancelled in the back row of the stand. Quite whose vision he could be obstructing from there wasn’t clear, but presumably the magic words of ‘health’ and ‘safety’ prevented the club from facing any legal challenges to the ban. While my recent trip to Germany to watch Borussia Dortmund had shown me just how fun watching football can be, I wanted to see if these views were shared by the wider football public. I asked a supporter of each team in the Premier League which European league they believed would be the most enjoyable to support a side in. Premier League – 4 – Arsenal, Chelsea, Manchester United, Reading. La Liga – 3 – Fulham, Norwich, West Brom. Bundesliga – 12 – Aston Villa, Everton, Liverpool, Newcastle, Manchester City, QPR, Sunderland, Southampton, Swansea, Stoke, Tottenham, West Ham. Serie A – 1 – Wigan. Clearly, the Bundesliga is the runaway winner. Consider the three main criticisms of the Premier League fan experience and is not difficult to see why. Aside from perhaps Luis Suarez, the things most likely to anger a supporter of a Premier League side are lack of atmosphere, no option for safe standing areas and expensive ticket prices. Compare this to the Bundesliga and it’s as if the Germans are playing a completely different sport. The clubs are 51% fan owned, ticket prices are not just affordable, but cheap, and as a result the atmosphere created is superb. The standard on the pitch is also increasing in quality year on year, with Bayern Munich reaching two Champions League finals in the last three years. Borussia Dortmund and Schalke have both come to England this season and dominated Premier League opposition, with Dortmund only denied victory over Manchester City by an inspired Joe Hart and a conclusive victory at the Emirates for Schalke. Every Bundesliga club progressed from their group as winners, while only half of the English clubs involved made it through. Another Premier League vs. Bundesliga contest will take place in the last 16, as Bayern Munich take on Arsenal, with all but the most blindly optimistic Arsenal fan expecting the Bavarian side to triumph. Victory for Bayern could well leave the Premier League without a single representative in the Quarter-Finals, with Manchester United facing a difficult test against Real Madrid. So how can the Premier League learn from the Bundesliga to offer a better fan experience? 51% fan ownership seems impossible for many clubs in the Premier League. The incredible levels of debt involved with most English clubs means the pattern of insanely wealthy owners is the only way to succeed. The three most recent winners of the Premier League title are Manchester City, Manchester United and Chelsea, all foreign owned and reliant on these owners to succeed. Despite the importance of these owners to the clubs financial state, only Sheikh Mansour of Manchester City remains widely popular. 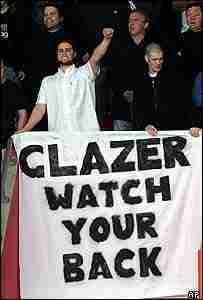 Manchester United have been protesting the Glazer family for several years, while Chelsea fans were infuriated by the sacking of Roberto Di Matteo, a true club legend both as a player and manager. 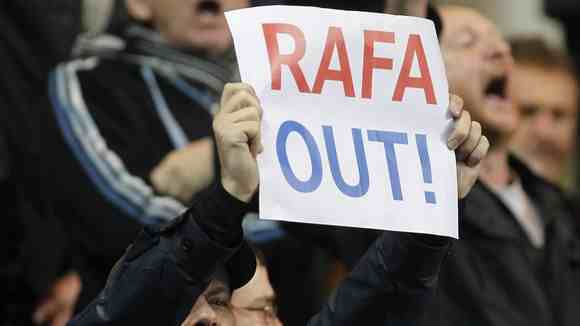 Unless Di Matteo’s replacement was Mourinho or Guardiola it is likely that the Stamford Bridge crowd wouldn’t have taken to whoever came in, but by bringing in Rafa Benitez, the Chelsea ownership might as well have employed people to slap every fan in the face upon entry to the stadium. Benitez was manager of Liverpool during a time the clubs had a bitter rivalry, contesting a number of highly important games in the Champions League and making some comments about Chelsea as a football club that were far from complimentary. 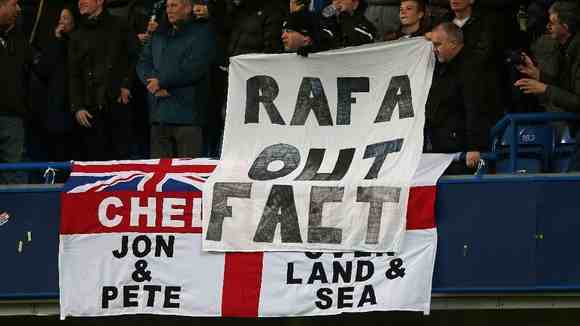 Benitez was made to feel as welcome at Chelsea as a bull at the annual china shop owners convention, with ‘Rafa Out’ banners appearing before the first whistle of his opening game in charge. Chelsea supporters have applauded in the 16th minute (matching the shirt number of Di Matteo) of every game since the departure of their hero, with the only chants aimed in the direction of Benitez presumably including a large amount of four letter words and perhaps the word “off”. Chelsea supporters are far from the first to hold furious demonstrations. 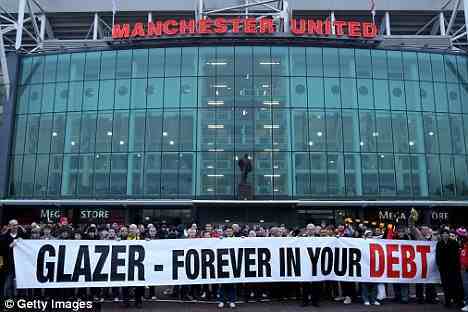 The ‘Love United Hate Glazer’ campaign has been well documented for several years, with the formation of FC United of Manchester the most drastic step alongside banners, marches and wearing of green and gold scarves, the original colours of the club. Unfortunately for protestors the green and gold scarf has become more of a fashion item than a sign of protest. Living in Manchester I often see tourists in brand new Robin Van Persie replica shirts with a green and gold scarf draped round their neck, missing the point of the whole thing rather spectacularly. 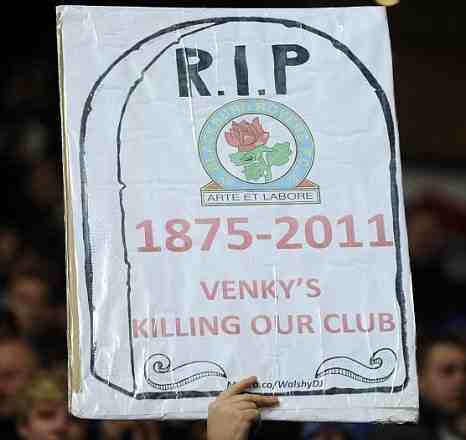 Meanwhile, one of the biggest storylines in the Premier League last season was the relegation of Blackburn Rovers and the constant protests against the Venky family. 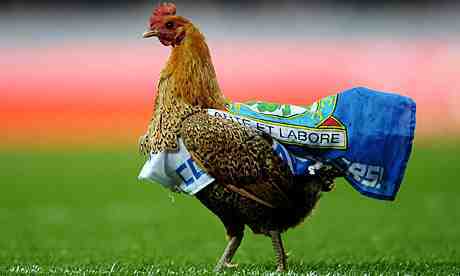 Blackburn are one of the only clubs to have won the top flight since it became the Premier League in 1992, but they have plunged into the Championship under the ‘guidance’ of the Venky’s, currently finding themselves in 12th place in the second tier, somewhat off the pace for promotion. Elsewhere in the Championship are Cardiff City, tradition and history cast aside with a rebranding exercise by overseas owners in hope of reaching the Premier League, while Birmingham City find themselves in a relegation battle, with Carson Yeung still officially in charge despite a legal battle and confusion as to who actually makes the decisions at the club. Rumours abound that Yeung’s son often makes suggestions to Birmingham’s various managers on players to sign based on how good they are on the PC game Football Manager. Birmingham City are not the only club from the second city in danger of relegation, with Aston Villa in real danger of slipping out of the top flight for the first time since 1988, with over 100 seasons in the top flight in total, and a long list of major honours including the European Cup and 19 domestic trophies. There are plenty more examples that I could list of questionable or downright dodgy owners in the Premier League, but it is obvious that there is clearly a problem at the top of the English game. If 51% fan ownership is not possible, how else can the Premier League be made into a more enjoyable experience for the people that used to matter the most, the supporters? Once again, the answer comes from the Bundesliga. Standing at football matches in England will always be a controversial issue due to the tragic events at Hillsborough where 96 Liverpool fans lost their lives, a disaster that continues to cast a black shadow over the sport today. Quite rightly, the dangerous terraces pens of old will never make a comeback in England. An option which is very much possible, and being supported by an increasing number of clubs, is safe standing. I saw for myself how safe these areas could be at Borussia Dortmund, with an atmosphere that changed my outlook on football forever. If 28,000 people can stand safely on one terrace in Germany, there is no reason why it cannot be done in England. Every German ground has an area where the fans can stand safely, and the result is an atmosphere where people attending the match can truly feel like a supporter, rather than a corporate customer. Safe standing allows for more people to attend matches, which as a result leads to cheaper tickets which are more accessible to fans who may have been priced out of the game. The reason the English game was the envy of many around the world in the past was the fans and the high levels of away supporters. Spanish football currently has very little tradition of away support (The recent Real Madrid vs. Real Sociedad game saw just 23 Sociedad fans making the trip to the Bernebau), with this one of the reasons why few people believe La Liga to be the best in the world, with some people unbelievably criticising Lionel Messi as a result of not having played in England. Quite why these people think Stoke and QPR would have more luck stopping Messi than Real Madrid, they never quite explained, but that’s a different argument. The 2011/12 Premier League season saw the most dramatic ending to an English season ever, Manchester City scoring two goals in injury time of the very last game to wrestle the title away from their neighbours. If fans are to continue enjoying watching moments such as this, something will have to change. By making tickets more affordable and matches more enjoyable to attend, the power of Sky Sports over the game will be weakened. If fans are able to get out of the house and visit the stadiums in person, clubs bowing to the pressure of Sky could become less common. Television having the power to control kick off times has seen Swansea supporters forced to travel to Sunderland midweek, while the invention of Monday Night Football creates all kind of travel nightmares even for home supporters, never mind those hoping to attend the game from the away side. There is no quick fix to the Premier League to make matches enjoyable again, and while the clubs are making money there is no reason to expect it to happen. The only voice football fans have in the modern game is through their wallet. If empty away ends become an increasingly common sight and fans continue to be priced out, the Premier League will eventually collapse. Leeds United are an example of what happens when a club “chases the dream” and the money runs out, with one of the biggest sides in England dropping as far as League One at their lowest ebb. With the current state of the English game and the different financial world which football clubs live in, it can’t be long until the Premier League dream becomes a nightmare for more top sides. Can the Premier League go on as it is without major changes? I personally do not believe so, and the days of football being a sport of the people are long gone. Football can be beautiful, but England is making it look rather ugly right now. Where is the next generation of supporters going to come from when clubs believe £126 is an acceptable price for 90 minutes of football? The answer to that question is coming, and I don’t think it’s one we’re going to enjoy when it does. Posted on January 12, 2013, in General and tagged best league in the world, Bundesliga, Premier League, Premier League best in the world, Premier League overrated. Bookmark the permalink. Leave a comment. Supporters Not Customers are proud sponsors of Barry Town United. This website will always be free. 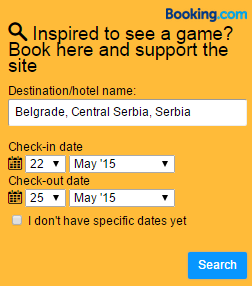 But hey, flights to Serbia and bribing Bulgarian police officers is expensive. If you want to help me out, you will have my eternal gratitude.